With a rise in heroin related deaths around the nation, including New Jersey, possession of heroin and drug paraphernalia used with heroin, like hypodermic needles, is treated very seriously and offenders face significant penalties if convicted of these crimes in New Jersey. In Camden County, NJ, heroin charges are issued on a regular basis to individuals accused of heroin possession and intent to distribute heroin. If you have been arrested for heroin possession in the Camden, NJ area, contact experienced New Jersey Drug Defense Attorney William C. Fay at 609-832-3202 to discuss defending against these serious drug charges. One example of an incident which led to multiple criminal charges occurred in Evesham Township, New Jersey recently. A Philadelphia man was arrested and charged with possession of burglary tools, as well as possession of drugs (CDS), and drug paraphernalia. Police responded to a report of the man allegedly wandering around the parking lot of Whole Foods and when they stopped him, they found pry bars, screwdrivers, a hammer, heroin, marijuana and hypodermic needles. 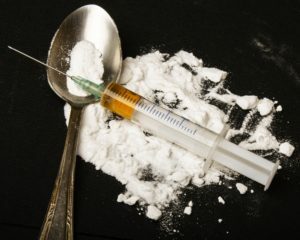 Under New Jersey law, possession of any amount of heroin is a third degree indictable offense, which carries potential imprisonment of 3 to 5 years, fines of up to $35,000, license suspension for 2 to 6 years, and community service. If you are found guilty of possession of heroin on school or park grounds, you may face a minimum of 3 years of imprisonment and a fine of $150,000. If the police have probable cause to believe that you were distributing the drugs rather than simply possessing them for personal use, you may face second or first degree charges. Intent to distribute can be proven by the submission of evidence of a large volume of drugs or possession of materials used to package and measure drugs. Whereas materials used to measure and package drugs may be evidence of intent to distribute, possession of drug paraphernalia—tools used to consume the drugs—usually indicates personal drug use (though it does not necessarily point to a lack of intent to distribute the drugs). Under New Jersey law, you can be convicted of possession of drug paraphernalia if you possess drug-related items like hypodermic needles, syringes, bongs, marijuana pipes, rolling papers, and cutting agents, to name a few. It is a disorderly persons offense that can carry a potential prison sentence of up to 6 months, a fine of $1,000, and suspension of your driver’s license for 2 years. Depending on the facts of your case, you may have one or more defenses available to you. Typically, in order to find drugs or drug paraphernalia in your possession, the police must conduct a search and seizure. Under the Fourth Amendment of the U.S. Constitution, you have a right against unreasonable search and seizure in any place where you have a reasonable expectation of privacy. In order to search an area where you have a reasonable expectation of privacy, the police must have your consent or a warrant issued by a judge, with a few exceptions. If police did not have your consent or a warrant and none of the exceptions to the warrant requirement applied, the evidence that the police have against you may be inadmissible in court, which would make it very difficult, if not impossible, to prove the charges against you beyond a reasonable doubt. In addition to arguments used to petition for the exclusion of evidence against you, you may have additional defenses available. If you are facing charges of heroin possession or drug paraphernalia in Camden County, New Jersey, contact experienced drug defense lawyer William C. Fay today for a free consultation. He will answer all of your questions and discuss ways to fight your heroin charges and potentially have your case dismissed.